Social media and mental health are closely linked. Keep track of habits. Does over use of social media affect one’s mental health? Social media is a powerful, and very popular digital platform for connecting with friend, family and people online. The most popular of these are Facebook, Twitter and Instagram. The negative effects of using these platforms has been well researched and repeatedly documented. 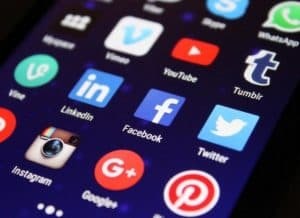 In fact, the founders of these social media platforms have publicly reported that when developing these platforms and digital algorithms, they were deliberately designed to be addictive in nature, causing users to return and scroll more and more. These designs have captured millions of users to be constantly focused on their electronic devises and essentially missing out of the real outside world. In a May 2018 article in Psychology Today , Dr. Mark Griffiths reports on the significant toll that over use of social media can have on the user and the pitfalls of becoming a habitual user. Other writers suggest the byproduct of over use of social media is a condition called anhedonia, which is when a person loses interest and pleasure in life in general. Those things that once brought a person some joy, fun, laughter start to seem boring and uninteresting. This also can begin a negative self-reinforcing cycle. That is, using social media impacts mental health by pulling people away from the “outside world”; the user continues using social media which leads to losing more interest in the everyday world while at the same time becoming more depressed, lonely and anxious. This cycle of social media usage and declining mental health then leads to further withdrawal and (likely) further use of social media. This has also been related to increased sleep disorders, eating disorders and greater risk of suicidal ideation. Not good. An entire generation of social media users will likely be more and more depressed, anxious and lonely. An effective first step is to simply pay attention to how much social media you consume. The very fact you are reading this article is a sign you are aware that this is an issue to address. There are now good tools at our fingerprints, in the very devices that link us to social media, that help us pay more attention to how we spend our time. Beginning with the iOS 12, iPhones now have a feature called “Screen Time”. The user can now receive reports on how much time is spent on various apps grouped under “Social Networking”, “Reading and Reference”, and “Productive”. One can limit access on individual apps and can view trends over time. It really is all about paying attention to how much time we look at a screen…and that can create more self awareness and habit changing. Suffice to say that not all the news is bad news. Indeed, social media has been applauded as a means of reducing isolation and helping folks connect, and stay connected, with supportive friends, family and community for those whom have difficulty making social connections in other (read in-person) ways. In conclusion, it is the manner in which one uses and engages with social media that is the key pivotal characteristic to having a positive or negative impact of social media.